Shares of Nvidia Corp. (NVDA), the world's largest manufacturer of graphics processing units, dropped more than 50% between September and December 2018. They have since recovered, however, rallying nearly 35% since Jan. 29. The company announced its fourth-quarter results on Feb. 14. Warning! GuruFocus has detected 2 Warning Sign with NVDA. Click here to check it out. 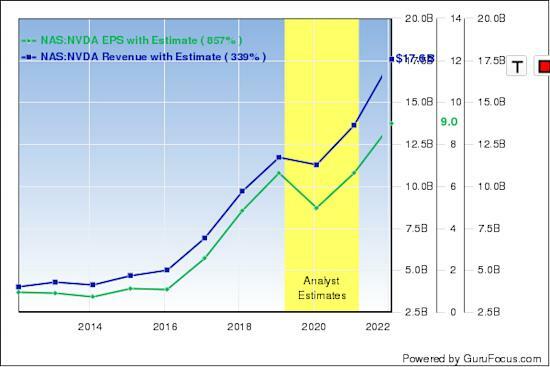 Nvidia reported adjusted earnings of 92 cents per share on $2.21 billion in revenue. This compares to earnings of $1.78 per share on $2.91 billion in revenue in the prior-year quarter. As such, the company's earnings declined 48% while revenue was down 24% for the quarter on a year-over-year basis. During the earnings call, founder and CEO Jensen Huang expresessed his disappointment in the results, saying it was "a turbulent close to what has been a great year." For the full year, revenue was up 21% to $11.72 billion while earnings of $6.64 per share grew 35%. Nvidia attributed its poor quarterly performance to the slowdown in the Chinese economy. As the leading buyers of GPUs, China and Taiwan account for more than 50% of the company's overall sales. Another contributing factor to the declining performance was the slump in crypto-driven revenue. Nvidia's top line benefited from the boom of the cryptocurrency market toward the end of 2017. In 2018, however, the market did not fare as well. The company has also experienced a buildup in GPU inventory, which, based on the most recent quarter, now stands at more than 70% of quarterly revenue. This contributed to Nvidia's decision to reduce shipments in order to thin out its inventory. While Chief Financial Officer Colette Kress said normalization could be achieved during the first quarter, analysts remain skeptical. Nonetheless, shareholders can be optimistic about the company's latest acquisition of Mellanox Technologies Ltd. (MLNX). On March 11, Nvidia announced it was buying Mellanox for $6.9 billion, an all-cash deal that will bring two data giants together. Mellanox is one of the world's largest companies in the data transmission market, serving the biggest companies. On the other hand, Nvidia provides products that help companies to process data. This acquisition should create very valuable synergies. Since Nvidia had $7.42 billion in total cash in the most recent quarter, it is in a good position to fully finance the all-cash acquisition. This means there will be no dilution of ownership and should keep earnings steady, thereby improving the valuation. Nvidia will also benefit from the autonomous vehicle market. Semiconductor companies have been heavily investing in the space because it could create opportunities in the server, communications, memory, processors and artificial intelligence markets. Alongside Intel Corp. (INTC), Advanced Micro Devices (AMD) and other leading semiconductor companies, Nvidia is expected to battle it out for dominance in what could be a major growth catalyst for years to come as auto manufacturers and consumers embrace self-driving cars. The company forecasted its addressable market for autonomous vehicles will hit $60 billion by 2035, which will play a crucial role in its next growth phase. On the other hand, Intel estimated its total addressable market, driven by a boom in autonomous vehicles, will be $100 billion by 2030. While Nvidia's performance suffered a slowdown in the final quarter of 2018, its future looks as promising as ever. With new market opportunities, potential synergies emerging from the acquisition of Mellanox and the current trends in the autonomous vehicle market, this GPU maker could hit new strides this year. Is It Time to Hunt for Defensive Dividend Stocks? Is Amazon the Best Blue-Chip Growth Stock? Is Criteo a Value Play in Digital Advertising?